Considering we’d had an entire week off, I knew I needed to attempt to do some homework. After doing some unavoidable procrastination on Twitter and Facebook, I finally managed to sit myself down and make myself read some of Le Malade imaginaire for my final project in Mme. Hersant’s class. I need to get a feel for what I need to have in my set so I can work on the design, and I need to start cutting scenes down/out so I can shorten the show since my advisor warned me that I’d need to do that way back when I suggested producing the show when I was a first-year. It had been a while since I’d last read the play, I forgot how hysterically funny it was. I’m not through the first act just yet, but I’ve already made some cuts and noted what scenes I need to go back and attempt to shorten. I can tell what kind of a “room” I need to create for my set, so I can start doing some research on modern-day bedroom/study furniture to do that. This is actually going to be a fun project. Sheila and I weren’t too sure when Kyle would be done with his game, but he said he’d text us when he was headed our way so we could tell Rouge to do the same. We’d assumed we’d be eating around nine, so we took a “snack break” around 6:30 and ate some more leftovers to make Madame think we’d eaten all of her food. The joke ended up being on us a little later. Kyle texted me at 7:00 to say he was on his way to our place, and he’d be here at eight. Merde. Once Rouge and Kyle got here (Rouge beat Kyle, for the record), we showed Rouge Kyle’s film debut, then we went to the crêperie. It’s called Pancake Square (1 Louise Michel 92300 Levallois), and I’m thinking it’s a bit of a chain. Madame told us later on that it’s brand new, it’s only been in our area since September and she hasn’t been there yet. I opted to order a sundae instead of a galette du sarrasin partly because I was still decently full from the snack that Sheila and I had, and partly because I was a little too nervous to ask if the batter they used really was 100% blé noir (buckwheat). Sheila ordered a sweet crêpe (a Mont St. Michel), Kyle and Rouge ordered savory ones (a Grand Frais and a Pirate). The savory ones are the galette du sarrasin ones, so they let me try little bites of them since that’s usually never enough to trigger a gluten-bomb for me in the event that there really was gluten in the batter. Oh goodness. Those crêpes were to die for. Certainly worth a gluten-bomb (Madame told me later that my chances are slim, they’re almost always 100% buckwheat flour). We’re going to back again sometime soon and I’ll order a savory crêpe and take my chances. Even better, the prices are great! On average, the crêpes about nine euro, which is a steal for all of the wonderful things they stuff inside them. One of the savory crêpes that Kyle and Rouge split had smoked salmon in it, for crying out loud. Including Kyle’s coffee, and my sundae, our entire tab was 39 euro. Not bad. I wasn’t too thrilled about getting up at 7:40 in the morning, especially after going to bed around two (that was because I’d set out all of my clothes so getting ready would be a breeze), but this is where my being a morning person really comes in (Aunt Pat, when I say “I’m a morning person,” I mean I can roll out of bed when my alarm goes off and function at a high level immediately, I don’t mean I get up with the roosters every morning, Mom totally ratted you out). Sheila and I ate right at eight, and headed out the door a little later than we meant to… Joan called me when we were walking to Kyle’s area to ask where we were and what kind of RER ticket she needed to buy. When I told her where we were, she didn’t seem too pleased that we weren’t going to make the 9:15 train (which would mean being at EuroDisney right when it opened at 10)… I assured her that the park would still be there when we arrived. By the time we met up with Kyle, got to his metro stop, went to Charles de Gaulle-Étoile to buy our RER tickets and get on the train, got off of the train at Châtelet to find Joan, it was about 9:30. We caught the next train headed to EuroDisney and got to the park at about 10:30. Since today was the definite last day of Halloween decorations, I found it amusing that the park was kind of “stuck” halfway between Halloween and Christmas. Once we got inside, we made a game plan. 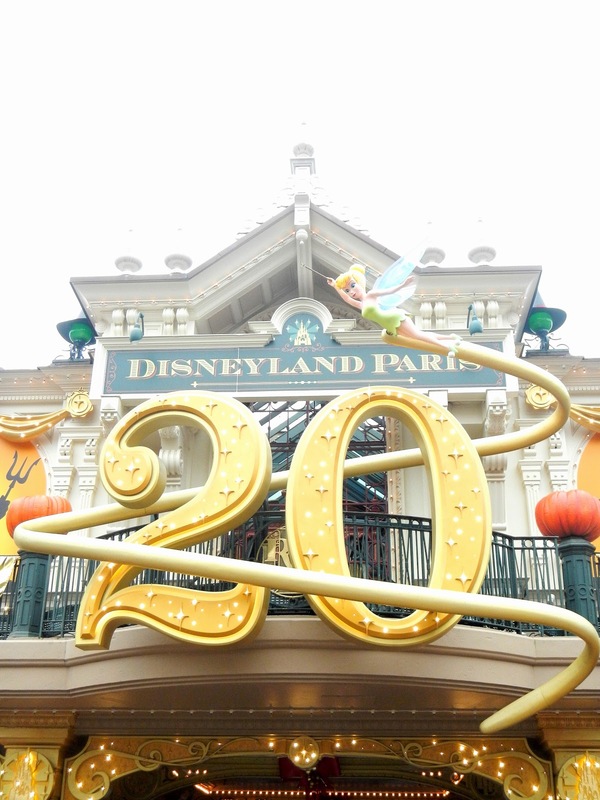 I knew that EuroDisney was very much like Disneyland (the one that I live 20 minutes away from when I’m at my usual college), and Kyle’s a bit of a Disney aficionado himself. Joan had NEVER been to an amusement park AT ALL before in her life, let alone a Disney one, so Kyle and I took it upon ourselves to make sure we hit all of the important rides to give her the best experience possible. We had to temper this with the fact that Sheila is not all that keen on every type of roller coaster: she doesn’t like roller coasters with inversions/corkscrews and she HATES roller coasters with 360 degree loops. Our first stop was Haunted Mansion. Joan’s like me when it comes to scary things, we both hate them. Some of our friends want to go see the new Paranormal Activity that came out in theatres. We won’t be caught dead there. I for one know that I will wet my pants if I see something like that. At any rate… we had to keep reassuring Joan that Haunted Mansion wasn’t scary. Sheila was a little nervous about it too. Joan and Kyle went in one of the “chariots,” Sheila and I went in the other. I feel like I can’t make a valid comparison between this Haunted Mansion and the one back home simply because the last… three times I’ve been on Haunted Mansion at home, it was all Nightmare Before Christmas-ified, and I can’t really remember what it looks like when it’s not like that. I feel like the cemetery room is a bit different, though. The scene with the crystal ball is done in both French and English. That reminds me, I’m not sure how I feel about the fact that most of the signs for things were all in English. 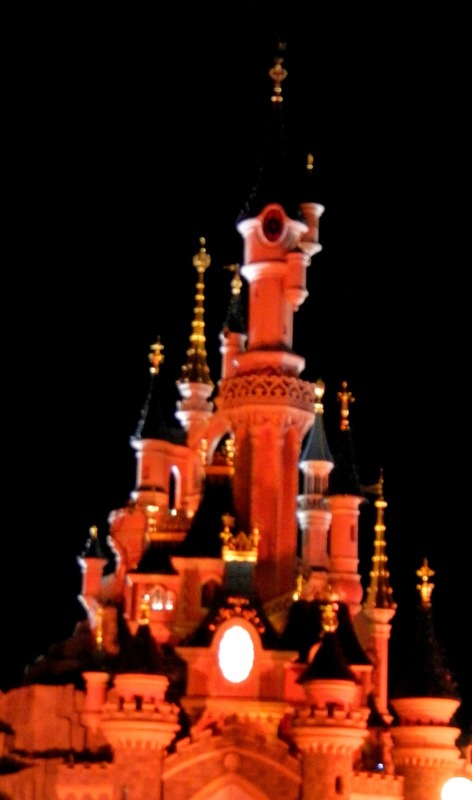 I realize that Disney is an American thing, but we’re in France, guys. Conform for Pete’s sake. I digress… We wanted to go on Thunder Mountain next, but by the time we got there, it was down for technical difficulties. We walked into Fantasyland after that, and literally walked right onto It’s a Small World (only a 10 minute wait according to the sign, and that was a lie). This is a ride I usually avoid back home since it’s always impacted (line-wise), and it’s kind of horribly annoying. I also have recurring cauchemars that the one time I go on this ride, it will malfunction, and I will get stuck on it for an unknown amount of time and come out with mental problems. I think the last time I went on this ride, I was a kid with my mom, so it’s definitely been a while. Most of the figures in the ride were “normal,” but some of them were already decked out for Christmas (and part of the song was “Jingle Bells”), which goes along with how the park couldn’t seem to make up its mind about what holiday it was celebrating at the moment… The entire song was in English. My mental jury is still out on how it feels about that. 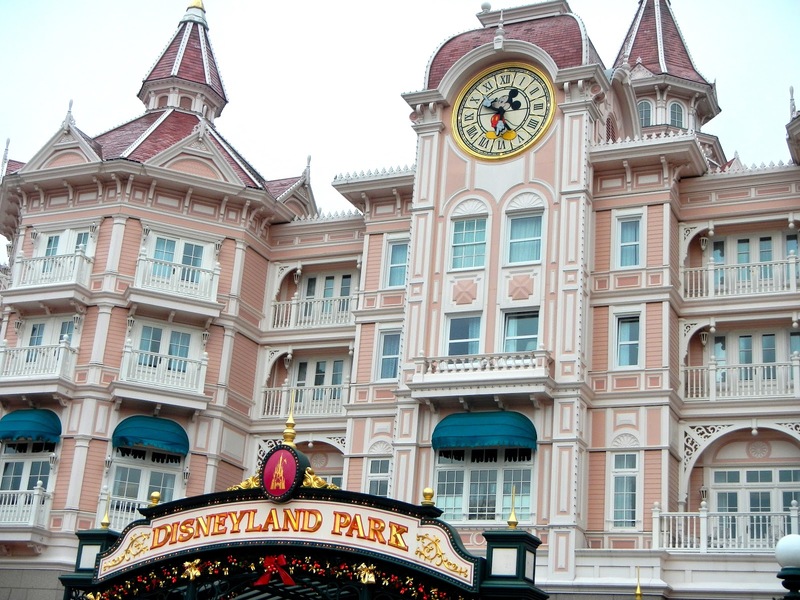 There’s no Tomorrowland in EuroDisney. It’s called Discoveryland instead. We walked over to Space Mountain and grabbed Fastpasses which were set for an hour after we’d grabbed them. Star Tours had a shorter wait time, so we went there first. We figured we’d get out of the ride about the time we needed to go over to Space Mountain to use our Fastpasses. I’ve done the new Star Tours in the California Disneyland a decent number of times, and had over 80 possible scenarios that you can sit through, so the ride’s always different. Once we got to the “loading bay” of the space cruiser and got inside, right when the ride was about to start, there was a technical difficulty. We were all moved over to a different cruiser for the ride, and that one worked. I definitely prefer the new Star Tours at home to this one, I think it’s more fun… Joan didn’t like it at all. We only had five minutes left in our Fastpass window by the time we made it to Space Mountain, and we didn’t have all that long to wait for the ride at all. It was definitely fun, and the atmosphere of the ride is a little more… rustic than the one at home. I think I prefer the California one to this one… We decided it was time to stop for a lunch break after Space Mountain, so we went to the nearest quick service food spot which was Café Hyperion. I got a three cheese salad (the chicken one had breaded chicken, so that was out) and hot cocoa for less than 10 euro. For Disney food, that’s not bad. My friends got cheeseburger meals complete with fries, drinks, and ice cream. It took Kyle a while to eat his burger because he got a little wrapped up in watching the old school Mickey Mouse and Friends vignettes that were playing on big projection screens around the dining area, so we were picking on him a little bit. I wolfed down my salad, but I didn’t have too much to worry about, I ended up finishing Sheila and Joan’s fries since they had too much food. Kyle’s favorite ride is Rock ‘n’ Roller Coaster with Aerosmith, so that’s where we went next. They’ve got this ride in the Florida Disneyland, so Kyle was the only one that had any idea what to expect. The idea is that you have Aerosmith blaring in your ears from the in-seat speakers, and there’s all sorts of concert-like lights in the ride itself. Joan wasn’t exactly excited about the ride when she saw the warning about how intense the ride was. Anything that bumped your head around too much wasn’t something she wanted to do because it would aggravate her new cartilage piercing in her ear. She threatened to use Kyle’s family jewels as a speedbag if she didn’t like the ride… You start off the ride going incredibly fast, and you’re immediately shot into a 360 loop and a set of corkscrews, which I thought was going to freak Sheila out (I was sitting next to Joan). Much to our surprise and delight (and Kyle’s relief), not only was Sheila fine (she’d also decided she loves loops and corkscrews), but Joan immediately got off of the ride insisting that we do it again! After our second round of this ride (which was probably everyone’s favorite of the day), we went on Tower of Terror one more time (the attendant messed with Sheila a lot this time, even to the point of saying “if anything bad happens, it’s all her fault”), then we headed back into Euro Disney. Thunder Mountain was back up and running, but there was a 40 minute wait… we didn’t care. All of us had kind of had it with one thing seems to be very exclusive to EuroDisney (or to France as a whole): PDA overkill. Joan created a point system for Line PDA. Five points if you saw an awkward romance like a bromance, 10 if you saw a couple making out, 15 if they were necking or ear-nibbling, 20 if they were making out and you could actually see tongue. Despite the fact that I was actively scoping for the entire wait in line… I couldn’t get on the board! I blame my height disadvantage… It was pitch black for most of the ride, which made it SO MUCH BETTER. I sat with Sheila on this one, Kyle was with Joan. There was a kid in front of our car, maybe around 12-13, and he’d randomly lay down on the ride, then pop back up. Sheila was having a good time on the ride, so this kid would turn around and have scream-offs with her, which the rest of us found hysterical. That kind of made the ride for us. We really should have headed home at this point, but we wanted to check out the Astro Blasters since that’s something Joan really needed to try. I’m usually pretty good at it, which Kyle didn’t seem to believe, so I challenged him to a shoot off. Loser would have to buy the winner candy (more than likely Toblerone) the next time we went to Carrefour. This line was 40 minutes long too, so all of us texted our host families in line and told them not to wait for us for dinner. Joan didn’t do too well with the game. Kyle tripled her score. Sheila smoked her, I doubled Sheila’s score. Kyle and I had both shot the best rounds we could remember. So who won the candy bet? I scored 136800. Kyle got 146200. He only beat me by 9400. Considering most shots get you 500 points, that’s… 19 shots? Both of us ended up in the same “level” by the game’s standards, so I don’t think he “smoked” me. Regardless, I will honor our candy bet. We headed home on the RER after that. I snapped a couple quick pictures on the way out. Les chewing-gums sont des grands romantiques. Ces coeurs d’artichauts s’attachent très vite. Chewing gums are great romantics. These artichoke hearts attach themselves very quickly. Is in every corridor: it’s the trash! I couldn’t not take that down. It’s freaking hilarious. Sheila and I ended up getting home around 10 so Madame chatted with us about Disney for a bit while she headed up the soup for dinner for us (perfect considering how cold we were). We had a salad, some ham, and the Ossau-Iraty cheese that Madame had brought back from her trip a couple weeks ago with the real jam, but there was only a small amount of it on a plate. We weren’t sure if it was all there was or not, but we left some on the plate just to be safe. I got a chance to Skype my boyfriend and Facetime my mom before I went to bed. I managed to figure out that I don’t have class tomorrow since my professor misread his calendar and thought his vacation went through Monday! 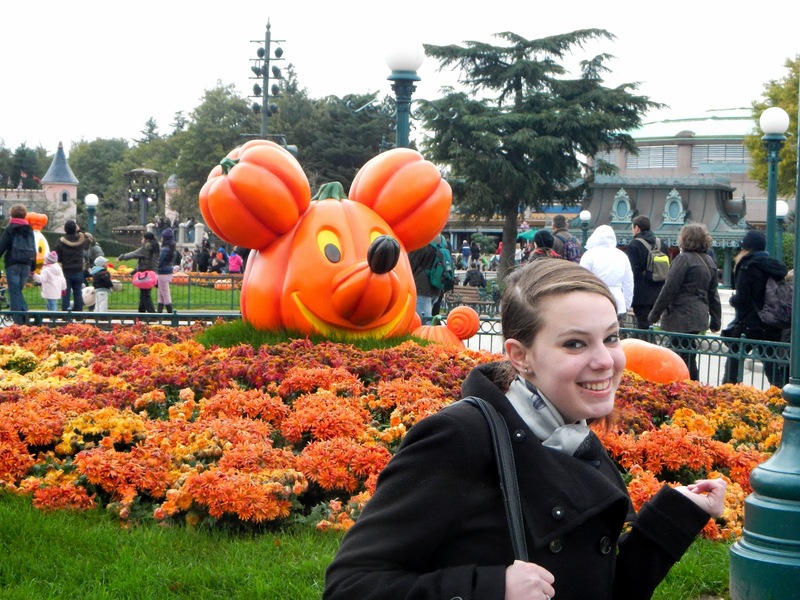 I had the best time at EuroDisney. I really didn’t want to go at first because I go all the time back home, and it’s really similar to that one… but what other opportunity was I going to have to go with Kyle and Joan? When it comes down to it… it’s not about the place, necessarily, it’s all about the people you’re with. I love my friends so much. I hate the fact that America is such a large country, and Kyle and Joan live on the other side of it… life’s not going to be the same when we see them every day over Skype instead of in person. For now, we’ll live it up as much as we can. And Kyle can be forever paranoid like the Trotsky that he is, but he only has himself to blame. 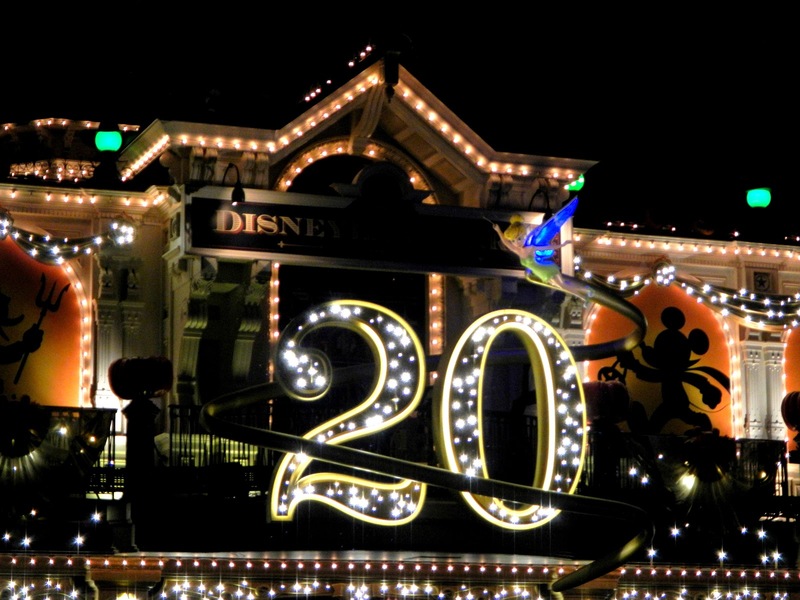 This entry was posted in Aerosmith, crepes, Disneyland, EuroDisney, France, french, Mickey Mouse, paris, poem, revenge, roller coaster, Trotsky. Bookmark the permalink.